Duplin Easy Muscadine ~ It’s National Drink Wine Day! I had a glass of my favorite wine in my hand when I saw that a Facebook friend had posted that it was National Drink Wine Day. It cracks me up that just about every day of the year is dedicated to a different food. I enjoy making fun of the idea by honoring as many of these silly days as I can and celebrating the chosen food with the rest of the country. 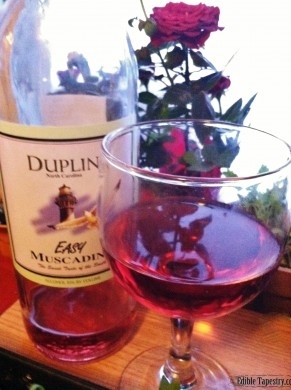 So I guess today is the perfect day to share on my food blog that my favorite wine is Duplin Easy Muscadine. It’s a very sweet wine, and so potent that I can taste the skin and seeds of the muscadine grape with every sip, as if I’m popping the fat fruits into my mouth, one after the other. I love muscadines so much that for several years in a row I planted a muscadine vine so that I could harvest my own. But something always goes wrong so I’ve yet to pluck a muscadine from my own yard. This past year, however, I came pretty close because my two year old vine was supposed to start bearing. Unfortunately, the nice man we have taking care of our yard and garden while we are away accidentally chopped it to the ground with his weed trimmer. I thought I’d miss out on my favorite wine when I went away, too, since it is a North Carolina wine, but there it was Friday night, right on the shelf in my local store’s wine section. So I will try again with my muscadine vine, but in the meantime I have my muscadine wine! Mmmm… Tastes like home.